2 Adding polygons to pre-existing models? 3 Is the MDL0 page correct? I'm not aware of this. Can you give me some examples of which BRRESs have this in. It seems that there are 2 different sizes plus a little padding. This was a failure of my. It apperars if the layer count is 0 and the layer offset points to the beginning of section 8. Then I detect the name of the base structure. I hex edited a model so the X and Y texture settings were 02 (mirror) but showed no difference (Layers section, addresses 0x18 and 0x1c. I checked with another model, a mach bike model, and it has 00000002 there on both). I'm too lazy to edit my uv maps in 3dsmax (I'm trying to make a character but the textures are weird). I took a quick look through the page but didn't see anything else that would change this setting. Any help? Adding polygons to pre-existing models? There are people trying to get Paratroopa into Mario Kart Wii. 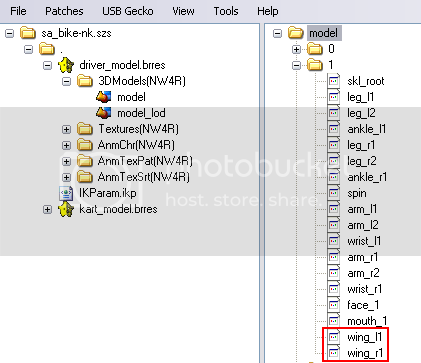 After taking a look through Koopa Troopa's files, I noticed he already has EVERYTHING needed to make Paratroopa work.. except a wing model. He even has bones for the wings already! And he has textures for them too. I would assume that.. since the bones are there, they're also animated (Recycled animations happen in MKW already.. Yoshi/Birdo share some animations. This would make me thing that Koopa Troopa and Paratroopa would share animations too). Has anyone found a way to hex edit in a new polygon? So with nothing more then hex editing this is possible? I haven't seen any animated character yet. Is the MDL0 page correct? At the moment I try to understand MDL0. But I can't follow the the descriptions. Example "section 1 - bones"
The page says, that the basic structure is 0xd0 (=208) byte long, but if analyzing Nintendo Moonview Highway, it contains 26 MDL0 files and section 1 is always smaller than 0xd0, the size is most 0x28. I can find such things also for some other sections. Either the page info is wrong or I don't understand the section concept of BRESS sub files. Not sure what the problem is here; the page seems to be correct. I suppose calling it section 1 is a little ambiguous; it's the section 1 entry's format. The pointer at the begining is to a BRRES Index Group which then in turn points to the data described. Interpreting the offset table, section 01 starts a 0xe4 and ends at 0x12c (length 0x48). Yes; if you look carefully that 0x48 data structure is a BRRES Index Group structure. It then points to the section 1 bones. It's another level of indirection to allow multiple bones, ploygones, etc. Thanx! It works now! And here is an example output of "wszst memory K_car_b.mdl"
It was not clear for me, that multiple entries of a section exist. And that is the reason that my string relocation fails sometimes. Damn!! I have already implemented this for the string relocation, long time ago ... and forgotten. Yes, I thought you must have, I was a little confused what you were asking at first. We all make mistakes! just figured I'd notify about a bunch of updates made to the page. These updates correct a few things with the vector info and bone-links, make note about the resource lists, as well as identify the fur vectors and fur-shell-layer vectors. It's been a few years now and there's definately tonz more knowledge to be noted... Though what I've done could be restructured and cleaned up a bit more. This page was last modified on 9 April 2014, at 15:14.